The new year’s seed catalogue will be out in six weeks, and all the summer crops are in, so it’s time to take stock of how the last year’s garden went. Water was a constant problem this past summer—lack of it, that is. My irrigation system held up pretty well, though. I added some extra taps along the irrigation line at the edge of the garden, and this reduced the length of hose I had to drag around. The drip irrigation line for my eggplants and peppers is aging, though. I might need to make a new one for next year. Birds were a terrible problem this past summer, destroying crops they’d never before bothered and never letting up all summer. Usually I only have to protect the peas and lettuce from them, and then only for a few weeks in early spring. This year I fought the birds all summer. It might have been the drought—there certainly wasn’t much food for the birds elsewhere in the yard—or it might be that the birds’ populations are up. Whatever it is, I’m going to have to more aggressively protect the garden next year. 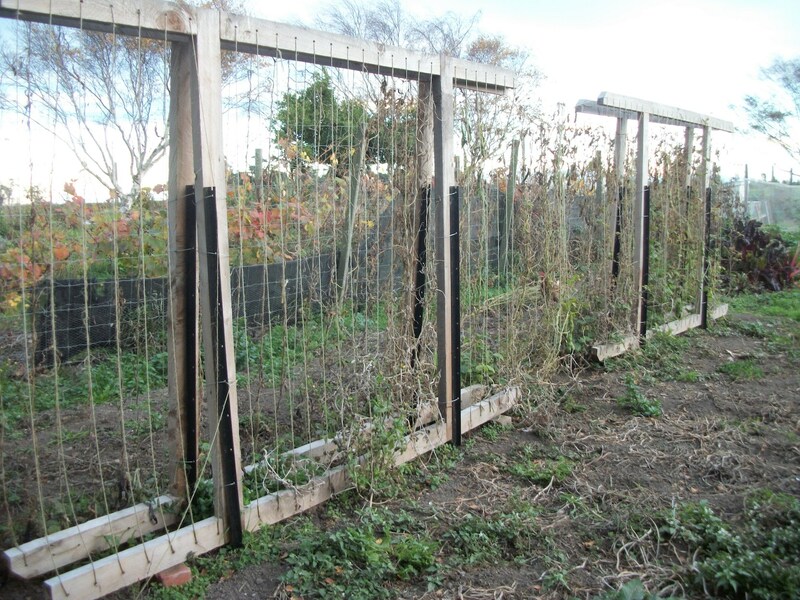 The new trellises Ian made me were perfect for peas and beans, but not so great for tomatoes. The jute I used holds up beautifully for tomatoes in the greenhouse, but in the high wind of the open garden, it broke. I’ll try the new trellises again next year, but strung with high tensile wire instead of jute. Summer squashes were a bust this year, not through any fault of mine, but because tree roots have again invaded the garden, and they sucked the squash bed dry. The same thing happened to a row of strawberries. We’ll have to get a trencher and cut the roots back before spring. Peas did beautifully this past year. The heirloom blue peas I planted for the first time were vigorous, stunning to look at, and produced right through summer. Unfortunately, the peas themselves turn an unappealing grey when cooked. I’ll plant them again, for sure, but I’ll have to look for some recipes in which I don’t mind grey peas. Pumpkins were a bit of a disappointment. Not that we don’t have lots of pumpkins, but we have fewer than I’d hoped. They were in the driest corner of the garden. That corner is always a problem. Perhaps I’ll have to set up some extra irrigation for that spot next year. I planted several new varieties of pumpkin last year, and was very impressed with Baby Bear—as cute and compact as Wee Be Little, which I’ve grown for years, but with better flavour. The Delicious tomatoes continue to impress me. I think next year I’ll plant more of them than I do Brandywines—they’re almost as tasty, and grow much better here. These and dozens of other notes are scribbled in my garden journal. I’m sure I’ll make more mistakes next year, but at least I won’t repeat the same ones!